Why? : Never Saw It Coming? Houston's at-grade METRORail is notorious for having been involved in several collisions with autos. An important question to ask is: what caused the accident*, the trolley that could not stop in time because of its very momentum or the relatively nimble vehicle that somehow managed to find itself in the path of the trolley? Obviously, a light rail advocacy group such as Light Rail Now! would quickly (and in obnoxiously large type) blame the drivers, and not without reason. After all, the group displays a picture of the rather extensive signals that inform drivers of an approaching trolley. Then again, I haven't personally visited Houston's light rail line. Do the signals malfunction? Do some auto-rail crossings lack sufficient warning? It could be said that the plastic dots that separate car and trolley traffic are insufficent. This is unlike San Jose's light rail system, in which curbs physically prevent vehicles from swerving into a trolley's path, at least not in intersections. Also, as a METRORail safety notice states, the trolleys don't make much noise, so drivers do not automatically receive an auditory cue to watch out for the trolley. Still, barring an automobile-automobile collision that pushes a car off course, good drivers will understand they are not to cross the plastic domes. And good drivers do not avoid collisions simply by ear; they use their eyes. What the safety notice suggests is just common sense. If drivers are taught to look in all directions and check their mirrors for other cars, why is the rail authority's expectation that drivers extend the same courtesy to at-grade trolleys, even those in semiexclusive rights-of-way like in Houston, merely "asking for trouble"? 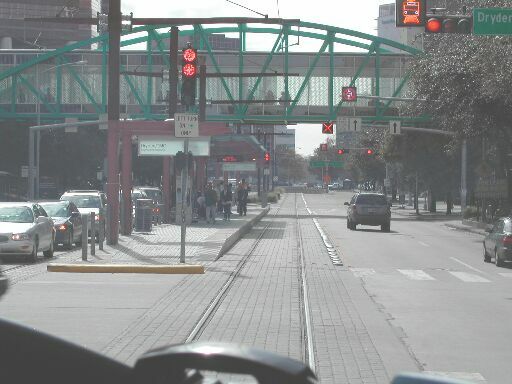 Of course, trolleys' removal from the streets of America resulted partially from the perception that they were getting in the way of automobiles and causing traffic jams, even though the trolleys carried more passengers in less physical space than automobiles and were in use well before autos became popular (unless you consider cars the horseless equivalent of horse coaches). As in the past, automobiles popularly take precedence over trolleys. Recently I almost caused a car-trolley collision in Downtown San Jose by forcing a vehicle, turning into a parking lot, to wait on the light rail tracks as I crossed the lot's driveway. The trolley was just leaving the neighboring stop and might not have been able to avoid hitting the car that was trapped between Mike the Pedestrian and the busy lanes of South Second Street. Fortunately I realized, midway through crossing, what potential damage might occur, so I hurried away. It's because of situations like this that I do give courtesy to turning vehicles by hurrying when I cross a street, just prevent problems, as in the occasions when inattentive drivers have almost hit me. (One exception: I refuse to cross quickly for those nuisance Harley riders who go blasting and loudly revving through downtown. Bad community members! May their cycles break down and strand them on a cell phone reception-free stretch of mountain road.) Anyway, this was one instance in which the car would not really be at fault for a collision, which is why all users of the road/street should show courtesy to each other. This, of course, includes car drivers' respect for the limits of trolleys. Update: It's about six hours after I wrote the previous paragraphs, and it just so happens that the intersection nearest my house (signalized crossing of a three-lane one-way and two-lane two-way) had an actual collision (two cars; a third might have been somehow affected). I dashed out with my phone to call an ambulance if necessary, but the people involved were just angry and not seriously injured. Now the police are here. A "torrent" of traffic now; the smashed-up cars probably got moved. I hope everyone is okay, but this demonstrates the point that rules of the road and traffic control devices are simply not enough to prevent bad driving. *Excuse me for using the word accident, as these incidents are usually preventable and hence not accidents. Collision is a more accurate term.